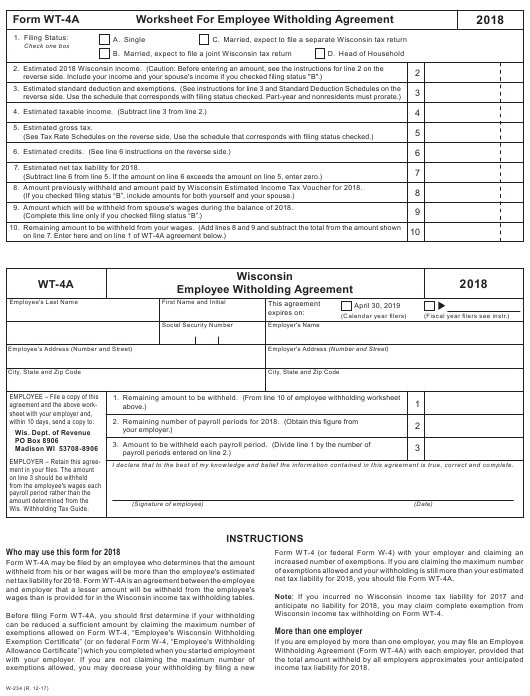 Form WT-4A is a Wisconsin Department of Public Instruction form also known as the "Worksheet For Employee Witholding Agreement (w-234)". The latest edition of the form was released in December 1, 2017 and is available for digital filing. Download an up-to-date Form WT-4A in PDF-format down below or look it up on the Wisconsin Department of Public Instruction Forms website. 2. Estimated 2018 Wisconsin income. 3. Estimated standard deduction and exemptions. 7. Estimated net tax liability for 2018. 8. Amount previously withheld and amount paid by Wisconsin Estimated Income Tax Voucher for 2018. 9. Amount which will be withheld from spouse's wages during the balance of 2018. 10. Remaining amount to be withheld from your wages. 1. Remaining amount to be withheld. 2. Remaining number of payroll periods for 2018. 3. Amount to be withheld each payroll period. I declare that to the best of my knowledge and belief the information contained in this agreement is true, correct and complete. net tax liability for 2018, you should file Form WT-4A. wages than is provided for in the Wisconsin income tax withholding tables. Wisconsin income tax withholding on Form WT-4. income tax liability for 2018. Complete both the WT-4A worksheet and the withholding agreement. after the WT-4A is filed with your employer. income, taking into account any changes you expect to occur in 2018. Form WT-4A will expire on April 30, 2019 for 2018 calendar year filers. Form WT-4A and place an “X” in the box. the Department of Revenue within 10 days after it is filed with your employer. ment may void the agreement by notification to the employer and employee. Other offices open on a limited schedule are Green Bay and Wausau. 6 months, or fined not more than $500 plus the cost of prosecution, or both. income over $50,430 ($252,150 x .20)is taxed at 7.65%. Form D-4A Certificate of Nonresidence in the District of Columbia - Washington, D.C.